A scene from last Sunday's 7th Grade class wedding. Thank you to Stephanie Zelazny for the photos. Mazal tov to the family of Jake Davidson, who becomes Bar Mitzvah this Shabbat morning, which is Shabbat Hagadol (the Great Shabbat - always during the week before Passover). Join us for services on Friday night and Shabbat morning. Jake's Mitzvah project was very special, as he, along with his dad Aron, participated on a Midnight Run, where he personally assisted homeless people living in the Hell's Kitchen area of Manhattan (see him above, in the special van). In his d'var Torah, he will describe that experience in great detail, and working with him to develop this speech was incredibly intense and moving. I'm hoping that his experience might set a tone for ways that our congregation can do even more than we already do for those lacking so much. I encourage you to join us tomorrow morning. 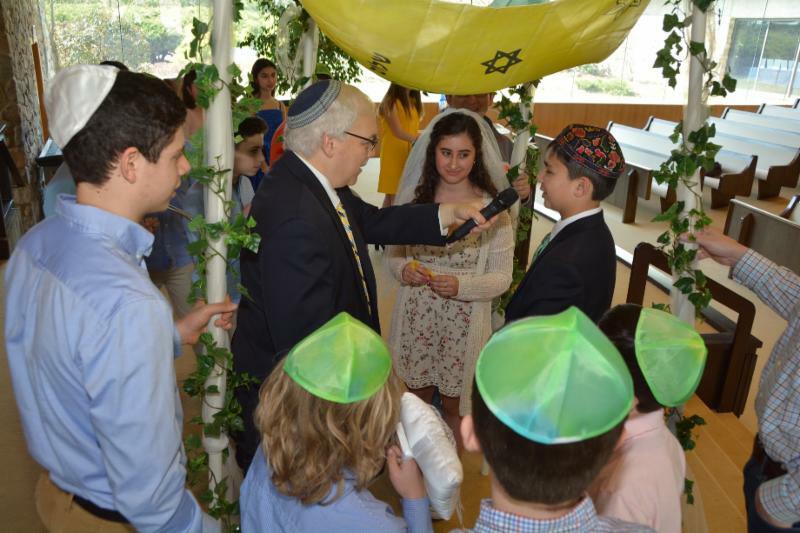 Speaking of great B'nai Mitzvah speeches, see Sammi Bradley's d'var Torah from last Shabbat. Note that there will be no Friday night service NEXT week, the first night of Passover. The "siyyum" (short study session) for the first born will take place at the conclusion of morning minyan on Friday. Please note that there will be no Shabbat-O-Gram next week. Hametz must be sold by Friday morning. When TBE congregant Gerry Ginsburg came to me several years ago to toss around some ideas he had about professionally transitioning, his choice came down to two of his great passions: Judaism...and wine. Fortunately, he ruled out another passion - playing linebacker for the Patriots. But when you think about what he has accomplished in his pursuit of rabbinic studies, I wouldn't have put it past him to succeed as a linebacker too. In fact, Gerry, who will be ordained this coming Tuesday by the Academy for Jewish Religion following many years of study, has proven to us that Judaism is much like a fine wine; it grows even better with age and never stops changing. He's a rare vintage himself, as Gerry has set a marvelous example of how one can continue to grow through all the seasons of life. His congregational family has marveled at his perseverance (and Fran's too! ), his desire to excel and to make a difference - and most of all, his passion for learning and leadership. Truth be told, Gerry has been making a huge difference in our Jewish community for decades, leading minyans, being president of our Men's Club, serving on our ritual committee and participating in any number of mitzvah activities. When he made his decision to go for the rabbinate, while on one hand it was surprising, it was not completely shocking. 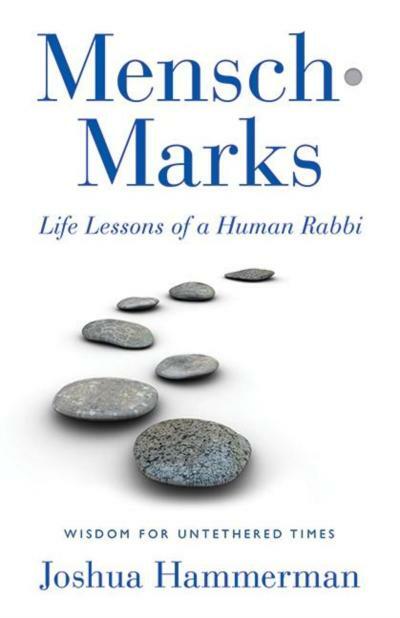 So, the first great lesson of Gerry's rabbinate has already been taught through his example. But that is only the beginning. While many of his rabbinic contemporaries are contemplating retirement, Gerry is not ready to become emeritus on the day after his ordination. He has so much to teach and so many to help. At TBE, he often leads shiva minyans, and without exception, families tell me afterwards how compassionate and helpful Gerry was. And now, he has agreed to help us out next year, handling some pastoral, liturgical and educational responsibilities, now as a professional rather than a volunteer. I'm honored that he will be doubling the rabbinic population of our staff! Gerry, Fran, Ruth and Sam have long mastered the art of leading by example, and the example that Gerry is now setting has placed the bar extremely high indeed. Mazal tov to Gerry and his family, and it will be my honor to present Gerry Ginsburg as a candidate for ordination on Tuesday. 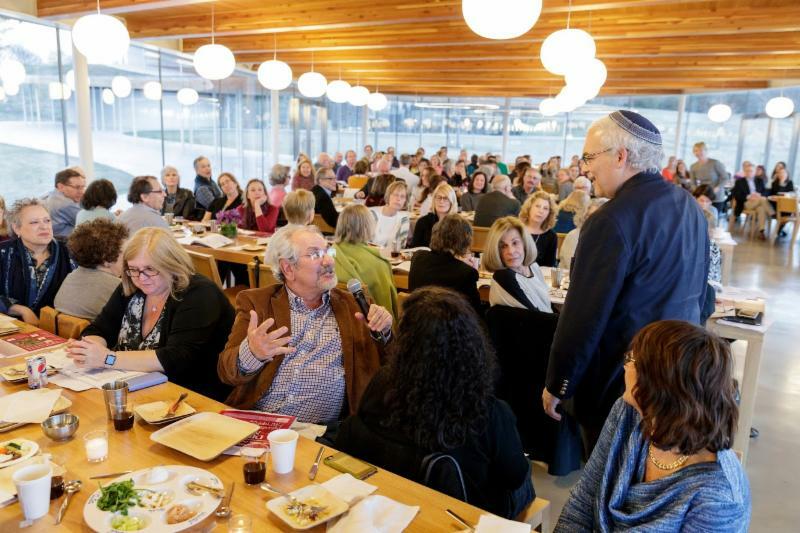 Register now for the Interfaith Seder at Grace Farms this Tuesday evening. In the Talmud, Hillel the sage says, "in a world that lacks humanity, be human." In the wake of recent hate-based massacres at a synagogue in Pittsburgh, mosques in Christchurch, New Zealand, and a church in Charleston, along with other unspeakable atrocities, the need for diverse faith groups to come together has never been greater. In that light, the close proximity of the upcoming holy days of Passover, Easter and Ramadan offer us a chance to turn these sacred moments into sacred encounters. On Tuesday, April 16 at Grace Farms in New Canaan, I'll be doing just that, joined by close friends who have become my partners in interfaith dialogue. I invite people of all backgrounds to join us, so that we might have as diverse a group as possible participating in this event. I'll be joined in conversation that evening by Grace Farms Foundation's Faith Initiative Director, Dr. Matthew Croasmun, along with Rev. Mark Lingle and Imam Kareem Adeeb. First I'll conduct a brief simulated Passover Seder, to set the tone for our conversations. Then, we'll engage in a deep discussion about the similarities and differences that Jews, Christians and Muslims have with regard to forgiveness and remembering. Focusing in on Pittsburgh, Christchurch and Charleston, we'll explore the significance of never forgetting the tragedies that harm our communities and degrade our common humanity. How does your tradition understand forgiveness? Are there offenses that ought not be forgiven? How do we forgive in ways that both tell the truth about the wrong that has been done and deal seriously with the possibility of future harm? Given the command in all three Abrahamic faith texts to "love God and love neighbor," how are we to respond to this current moment of unspeakable violence? Is it possible to forgive and never forget? What does remembrance mean in light of the possibility of forgiveness? One question that I've been asked often since Pittsburgh is whether Jews should "turn the other cheek," as Christians are often called upon to do. It's interesting fodder for discussion, and we'll talk about it at Grace Farms. So why does Judaism not encourage the unconditional embrace of your enemy? When you turn your cheek, you are no longer looking at your offender in the eye, face to face. True reconciliation can only occur when two human beings can truly see what is human in the other, and how each of us is created in the Divine image. But there are times when such authentic encounters simply can't happen. The Pittsburgh perpetrator showed no signs of remorse during his appearance in court, and it is doubtful that he will when he stands trial. It would be a grave injustice to blindly forgive him. Rabbi Abraham Joshua Heschel wrote, "Morally speaking, there is no limit to the concern one must feel for the suffering of human beings, that indifference to evil is worse than evil itself, that in a free society, some are guilty, but all are responsible." We all share responsibility, not for the offensive acts of those who killed innocent worshipers in cold blood, but for forging the alliances that can at long last subdue the hate. There would be no better time to build strengthen these alliances than during our holiest of weeks, a time when that holiness is shared. I hope you'll be able to join me and my colleagues next Tuesday. It is important to have a strong representation from the Jewish community. If you have never been to Grace Farms, it is one of the most pristine, spiritually stimulating places on earth. For more information, go to https://gracefarms.org/events/interfaith-seder-2019/. 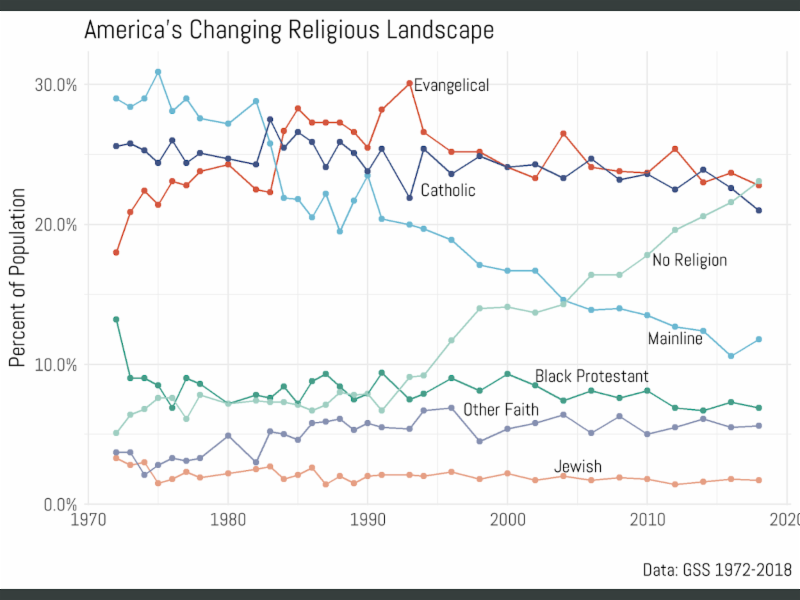 Note the dramatic increase of the number claiming to have "no religion," which has just become the largest "religious" grouping, passing Evangelicals. Jewish numbers, though small, have remained surprisingly steady. Mainline Protestant seems to have turned a corner, following a long decline, and Catholics and Evangelicals are dropping somewhat. I feel that Judaism is uniquely positioned to appeal to the "nones" as this growing unaffiliated group is called, because Judaism is more than a religion. To be a Jew is to be part of a people as well, and most Jews - in Israel especially but also here - identify along those lines, because most possess a secular world view. Some call it "spiritual," but very few Jews, including those who are extremely identified as Jews, call themselves "religious." This week's news from Israel can be summarized in two charts. 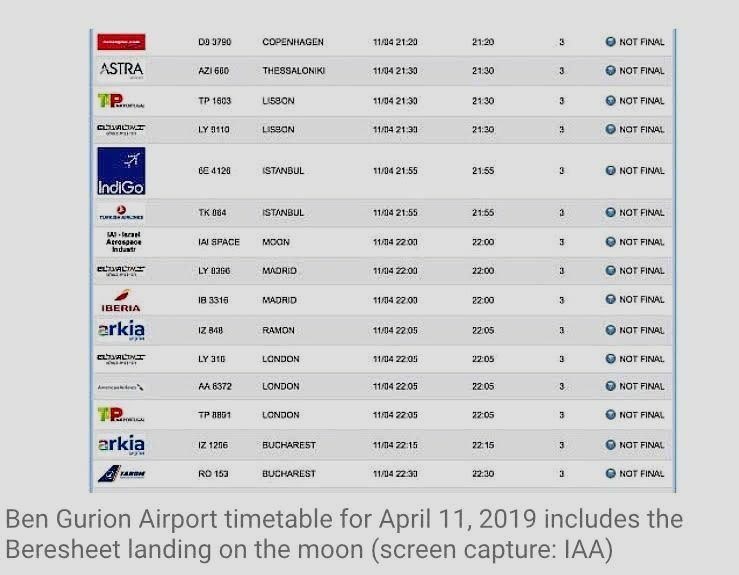 This top one was a screenshot of the landing board at Ben Gurion Airport yesterday. You can see in the middle, "Moon," as Israel was primed to land its first spacecraft on the moon. The landing failed, but still it was a moment of great pride. 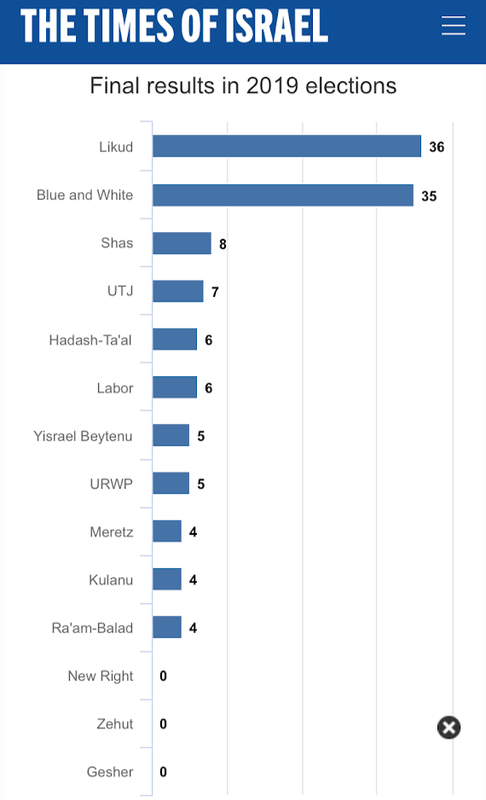 The second chart is the final results of the Knesset elections held on Tuesday. These results will be analyzed for weeks, with enormous implications for the future of Israel as well as the Israel-Diaspora relationship. For now it's best to simply congratulate those who made it - a number of parties were left on the outside looking in - and continue to actively engage in efforts to guarantee a bright future of a democratic and secure Jewish state. Order your fair-trade, kosher-for-Passover chocolate bars today and ensure that your seder is free of the child labor and child slavery that plagues much of the cocoa industry. The maror (bitter herb) that we eat at seder reminds us of the pain of slavery. This year, let the sweetness of the first kosher-for-Passover slavery-free chocolate remind us that liberation is possible, and tasty, too! These delicious chocolate bars-in flavors that include chocolate espresso bean and lemon ginger chocolate-are the very first Passover chocolate guaranteed to be free of slavery or child labor. You can order your fair-trade, slavery free chocolate here, and click here to see what Fair Trade is a prime Jewish value. This year's chocolate includes a sample box of all eight varieties of chocolate that you can give as a gift to your host. Moving from the palate to the Plate, here are some Passover and Haggadah-related downloads that I recommend to enhance your Seders. HIAS Haggadah Supplement: Welcome the Stranger, Protect the Refugee - timely material to enhance your Seder, from the legendary organization that has protected and resettled refugees since the Jewish immigrants of the Lower East Side in 1881. Limmud Hevruta Project - Limmud has compiled an alternative four questions for you to explore with your family and friends this Pesach. Study material is provided on topics such as, "Are Jews outside of Israel truly free?" "Are Jews in Israel truly free?" "Are non-Jews in Israel free?" And, "What does this mean to you?" Guaranteed to start an interesting and deep discussion about Jewish identity - or a brawl. Pardes Interactive Seder Activities - fun activities for all ages designed to make your Seder memorable, including "Truth or Dare" prompts. Shalom Hartman Institute Pesach Resources - a selection of essays, videos, and Seder material for download by Hartman scholars on Pesach, exploring a range of issues.